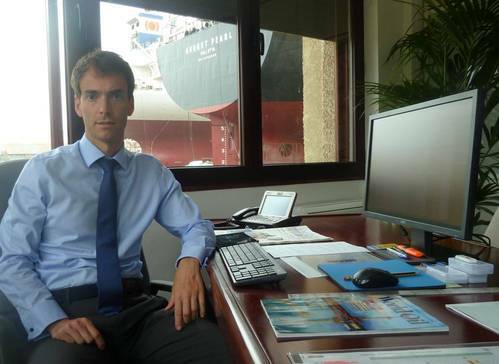 How did you find a career in the maritime industry? As a consequence of my father´s dedication to the industry, as founder of a shipping agency in the early eighties as well as partner in a large shipping company and shipyard´s ownership, I grew up in this atmosphere and orientated my academic training towards being able to continuing what he and his business partners created and developed. Although I did start my professional career dealing with other type of businesses within my family, the core root of our family wealth has always been in the maritime industry. For our readers not familiar, please provide a brief overview of your company? Astican is a ship repairing and conversion yard plus a heavy offshore project management company who belongs to a billion dollar shipping group. This group is active in the business of owning, chartering and operating refrigerated cargo vessels, bulk carriers, product tankers and fish factory vessels, the supply of bunkers at high seas, the trade of pelagic frozen fish, the ownership and operation of shipyards, the development and operation of bulk terminals/port facilities and the provision of ship agency services. In Astican & Astander shipyards we are capable to perform any type of repair and/or conversion in any type of ship or rig. The shipyard is part of the group since 1989 as before it was run by the Spanish Government. Also, in 1999 our Group took over Astander shipyard in Northern Spain. Both were part of a public entity called “Astilleros Españoles” Group until then. The two shipyards, one in the Canary Islands and the other in Northern Spain´s mainland, offer a full range of repairs, upgrading and conversions services to first class customers based worldwide. Astican is equipped with a lifting platform capable for ships up to 36,000 dwt and has seven ample docking lines and a 900 linear meter repairing pier with up to 25 m of water depth. This happens to be an alternative facility, logistically, to provide excellent service to drilling units that may require specialized works such as thrusters removals. The shipyards are fully equipped with their own steel, mechanical and piping workshops plus Wärtsilä propeller’s repairs workshop within the premises. Also coming in November 2015, Astican will have Rolls-Royce Service workshop at the yard fully equipped to service thrusters and other equipment belonging to RR’s marine services. This brand new facility in Las Palmas is one of only three overhauling facilities of its kind in the world which are located in North Sea, Gulf of Mexico (Galveston) and Río de Janeiro. Astander has two graving docks – 160m and 230m long – and also own repair berths. Astander in particular is a very well experienced shipyard in doing large conversion projects with tight scheduled. We have converted either fish trawlers or cable layer vessels into seismic vessels, PSVs into seafood factory vessels, for example. Looking at your time at the helm, how is the company most the same, and how is the company most different? Astican has already a long history servicing the Port of Las Palmas and ship owners passing by as we are located geographically at the crossroads of main trading routes in the Atlantic. Therefore the skill of our personnel has been fully proved throughout the years prior to my times. The shipyard already had a reputation in the market and a business structure well dimensioned and established to allow fulfilling first class customer´s demands. It is our first aim to keep the level of quality and reliability of the projects we deal with, as part of our success is based in the number of customers that repeatedly trust us for the works on their fleets. Nevertheless, facing the challenged times we are going through, our team has established a clear pattern of moving another step forward to achieving the demand of new services in our region, mainly related to Oil & Gas Industry. Consequently, we are now improving our business offer developing a new range of services we can provide in our area of influence. One specific action I am doing is to move foward to make Astican the One-Stop-Shop location for the deepwater offshore industry in western Africa in order to offer to rig owners as much cost savings as we are able to get due to synergies with the OEMs such as Rolls-Royce, and more to come. The industry is facing challenging times and we are here to help them. Related to the above, earlier this year we have partnered up with Rainmaker and Offshore Inland in Houston in order to give a closer and better service to the industry. If you had to pick one or two major areas, how would you best characterize your “bread and butter” business? We can say the range of services and capabilities is common but the market we provide them can be considered as “Oil & Gas” and “Marine” Divisions. No doubt about the common needs of repairs and upgrade projects in terms of basic characteristics of them: steel renewals, surfaces treatments, piping works, machinery, etc. but the approach may vary and so we have adapted our working methods accordingly. The Ship Repair and Conversion business, as you know better than I, is ultra competitive: What makes ASTICAN and ASTANDER stand out? Obviously our geographical locations assists, giving us the opportunity to offer our services to a wide range of customers. But should we fail to give adequate would have grown as we have. It has been our aim to maintain a fair and honest approach to each of our projects. Our prices cannot be comparable to those of other cheaper regions but we always try to assure the mutual beneficial result assuring best possible personal approach and service, skill of our workers, reliability of our works program, and honorability of the approach and avoiding hidden surprises for our customers. We think this is the only way to assure a future in our business. On top of that, we always meet the planned schedule of the projects, avoiding delays to owners. Looking ahead to 2016, what statistics do you monitor and how do you see your business shaping up? The main one is the oil prices. We understand that, once the prices recover, the operators will start awarding contracts again so all drilling contractors will begin a race to reshape their units and we have to be ready to assist them and ensure good delivery times and prices. On this regard, we have recently signed a cooperation agreement with HHI to support them to accomplish their warranty, commissioning and finishing works in the new build units coming from Far East to any of the E&P areas in the Atlantic Ocean, Mediterranean or North Sea. This good collaboration is already working through one drillship project in July 2015 and we expect that it continues growing through 2016 and the future, giving good advantages to our common customers. Concerning the rest of the fleets, we foresee also a slight recovery also affected by the oil prices and consequently the freight rates. How has the recent (prolonged) drop in oil pricing affected your business? It is obvious that mainly the oil and gas industry is experiencing a lot of changes due to the low oil prices, some of them are related to the periodic maintenance and repairs of the drilling units, that of course directly affects us. There are many units out of contract and suffering cancellations in their drilling programs and, apart from that, due to the oversupply in drilling units as a consequence of the big amount of new builds coming to the market, most of companies have decided to retire their old units for scrapping instead of invest in long shipyard periods for life extension, postponing their SPS and new build deliveries and warm/cold stacking the rigs without contract with minimum capex in overhauling. We, at Astican, perfectly understand this situation and are supporting our customers by assisting them to reduce their costs. By market sector please discuss “what is hot” … “what is not” … and why? ■ Offshore: We are detecting slight decrease in the scope of repairs for the offshore market as a consequence of the low oil prices. ■ Reefer: Decrease through the years due to containerization of the cargos. ■ Tankers: Increase in recent years of the repairs at ours of this type of vessel as a result of the increase of their activity in Western Africa Region. ■ Military: Stable market that could even increase due to the renewal of the Spanish fleet assigned to the Canaries. ■ Bulker: Very low amount of repairs being carried out in our region mainly due to nature of repairs required, for example extensive steel repairs. In these cases owners’ tend to take vessels to China. ■ Gas tankers: It is not our core business, but for the sizes we can handle it remains stable. ■ Fishing fleet: More than 30 years ago, it used to be our main repair activity thanks to the Ex- Soviet Union and Korean fleets. Nowadays we keep repairing around 50 fishing ships a year. Regulation is a big driver for ship outfit and refit. Looking at the coming years, what regulation(s) do you see as driving business? We are focusing some of our efforts in the scrubbers’ installation and its different systems, as a consequence of the need to comply with the NOx and SOx reductions imposed by IMO. On this regard, our other shipyard located in Santander, in the North of Spain, has successfully fit a few of these systems onboard a fleet of ferry boats, with some other prospective projects ahead. The other focal point is the ballast water management as per IMO and USCG regulations. Astican’s geographical position is, in addition to our flexibility and quick dry-docking system, is advantageous, being at the crossroads of the Atlantic. How are you investing now to prepare for this surge in business? Our investing policy is mostly focused in developing new areas, training and having strategic alliances with key players. For instance, we are studying needs in the O&G industry that can be implemented in the Canaries as to add value to our services in these challenging times for the owners. Every business has its challenges. What do you consider your biggest challenge today? Since Astican was built, we have noticed how changeable this business is. Initially, our core business was the fishing fleets in the Atlantic, mostly the big factory vessels from the Soviet Union. When the fall of the Wall was a fact and the Soviet Union dismantled, we saw our business endangered so we had no other option but to adapt to the circumstances and be flexible. Our challenge is always to be ready to adapt to new needs, new markets and new regulations. For instance, in 2000 we came across with the first oil rig. We adapted our procedures as per the owner’s requirements and nowadays, after 15 years, it represents one of our main market niches. At the end of the day, the big challenge is to be able to survive to a non predictable market year by year. This is why we took the decision many years ago to have very good in-house project managers and key technicians ready to handle up to a thousand of skilled blue collar workers when we need it from well trained subcontractors. Having the lowest fixed costs possible allows us to offer better quotations and to keep a strong financial position. Please describe, in as much detail as possible, the most challenging repair/conversion job you have encountered in the past year, with insight on how the challenge was met. We have had a few of them. In Astander we have been very busy with the lengthening and conversion of a Canadian scallop factory vessel and the conversion of a platform supply vessel into a clam harvesting and processing factory ship from the same Canadian owner. In this last one, the conversion included the removal of the bulk cargo systems and the fabrication and installation of two factory decks, sponsons and new accommodation. A new ammonia refrigeration plant was installed, as well as a freezer tunnel and plate freezers. New hydraulics systems were mounted to provide service to the winches, fishing equipment and Factory systems. A new accommodation meant new cabins, rooms, A/C system, piping, electricity. The propellers were replaced and the gearboxes reconditioned. New systems were installed: two gensets, a new dredger system, high capacity and pressure dredging pumps, new steam boiler to give service to the fish processing plant, installation of a new incinerator, a new lift, etc. Between 2014 and 2015 we had the big conversion jobs on three French ferries, comprising the removal of the existing exhaust systems and replacement of the silencers by the new scrubbers. Installation of the new seven scrubbers (four for the M/E and three for the A/E). Rerouting of the existing pipe network in the casing. Installation of new pump rooms. Installation of the new exhausts and water system piping. Fabrication and mounting of new enlarged funnel. Installation of new electrical systems, control systems, insulation, structural modifications and other auxiliary jobs. Due to the limited space available in the casings, and the important interference of piping and structural systems, the tight delivery time was achieved by means of a correct planning and strategy of removal/mounting process. Apart of the specific works related to the new plant, the vessel was extensively upgraded and major repairs were carried out. On the other hand, the most challenging projects accomplished by ASTICAN last year, which have continued in 2015, were a block booking of six heavy Norwegian Anchor handlers coming from Brazil and four other offshore vessels from another Norwegian company, all the while attentioning the different projects on 13 rigs, too. To sum up, the most important challenge was to carry out this outstanding level of work keeping customer’s satisfaction. I guess we are doing it with the support of our project management team since those owners keep coming to quote new projects. This shows the confidence these owners have in our shipyards.